The FDA approval of trabectedin represents the availability of a new treatment option for patients with liposarcomas or leiomyosarcomas—2 malignancies that account for 35% of all soft-tissue sarcoma cases.6,18 Trabectedin is indicated for the treatment of patients with unresectable or metastatic liposarcomas and leiomyosarcomas that were previously treated with an anthracycline-containing regimen. In a pivotal phase 3 study, treatment with trabectedin demonstrated a 45% reduction in the risk for disease progression or death compared with dacarbazine. 1. National Cancer Insitute. A snapshot of sarcoma. November 5, 2014. www.cancer.gov/research/progress/snapshots/sarcoma. Accessed October 30, 2015. 2. Mayo Clinic staff. Diseases and conditions: soft tissue sarcoma. July 1, 2015. www.mayoclinic.org/diseases-conditions/soft-tissue-sarcoma/basics/definition/con-20033386. Accessed October 30, 2015. 3. National Cancer Institute. SEER stat fact sheets: soft tissue including heart cancer. http://seer.cancer.gov/statfacts/html/soft.html. Accessed November 5, 2015. 4. Italiano A, Mathoulin-Pelissier S, Le Cesne A, et al. Trends in survival for patients with metastatic soft-tissue sarcoma. Cancer. 2011;117:1049-1054. 5. American Cancer Society. Sarcoma: adult soft tissue cancer. Revised March 16, 2015. www.cancer.org/cancer/sarcoma-adultsofttissuecancer/detailedguide/sarcoma-adult-soft-tissue-cancer-key-statistics. Accessed November 6, 2015. 6. Toro JR, Travis LB, Wu HJ, et al. Incidence patterns of soft tissue sarcomas, regardless of primary site, in the Surveillance, Epidemiology and End Results program, 1978-2001: an analysis of 26,758 cases. Int J Cancer. 2006;119:2922-2930. 7. National Comprehensive Cancer Network. NCCN Clinical Practice Guidelines in Oncology (NCCN Guidelines): soft tissue sarcoma. Version 1.2015. February 9, 2015. www.nccn.org/store/login/login.aspx?ReturnURL=http://www.nccn.org/pro fessionals/physician_gls/pdf/sarcoma.pdf. Accessed November 5, 2015. 8. Demetri GD, von Mehren M, Jones RL, et al. 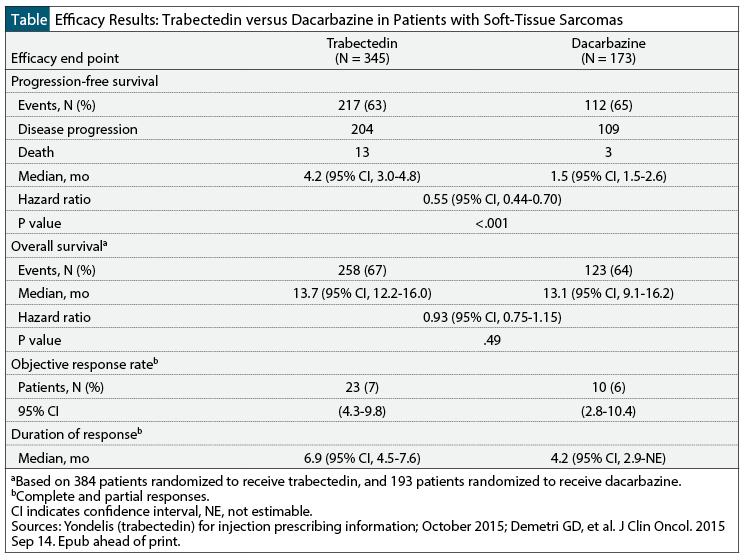 Efficacy and safety of trabectedin or dacarbazine for metastatic liposarcoma or leiomyosarcoma after failure of conventional chemotherapy: results of a phase III randomized multicenter clinical trial. J Clin Oncol. 2015 Sep 14. Epub ahead of print. 9. National Cancer Institute. Drugs approved for soft tissue sarcoma. Updated September 16, 2014. www.cancer.gov/about-cancer/treatment/drugs/soft-tissue-sarcoma. Accessed November 10, 2015. 10. Cosmegen (dactinomycin) injection [prescribing information]. Deerfield, IL: Ovation Pharmaceuticals Inc; March 2008. 11. Adriamycin (doxorubicin HCl) injection [prescribing information]. Bedford, OH: Bedford Laboratories; January 2014. 12. Doxil (doxorubicin hydrochloride liposome injection) [prescribing information]. Horsham, PA: Janssen Products, LP; April 2015. 13. Gleevec (imatinib mesylate) tablets [prescribing information]. East Hanover, NJ: Novartis; January 2015. 14. Sutent (sunitinib malate) capsules [prescribing information]. New York, NY: Pfizer Inc; April 2015. 15. Stivarga (regorafenib) tablets [prescribing information]. Whippany, NJ: Bayer HealthCare Pharmaceuticals Inc; April 2015. 16. Votrient (pazopanib) tablets [prescribing information]. Research Triangle Park, NC: GlaxoSmithKline; September 2015. 17. Yondelis (trabectedin) for injection [prescribing information]. Horsham, PA: Janssen Products, LP; October 2015. 18. US Food and Drug Administration. FDA approves new therapy for certain types of advanced soft tissue sarcoma. Press release. October 23, 2015. www.fda.gov/NewsEvents/Newsroom/PressAnnouncements/ucm468832.htm. Accessed October 30, 2015. 19. Janssen. U.S. FDA approves Yondelis (trabectedin) for the treatment of patients with unresectable or metastatic liposarcoma or leiomyosarcoma, two common subtypes of soft tissue sarcoma. Press release. October 23, 2015. www.janssen.com/us-fda-approves-yondelis-trabectedin-treatment-patients-unresectable-or-metastatic-liposarcoma-or. Accessed November 4, 2015.